Put finger on plasma ball. Embarrasingly simple - one frame was all it took :-/ The only 'trick' was using a fast lens and iso1600 to give a fast enough shutter in a pitch black room. Print version has been cleaned up using Fred Miranda's ISOX Pro noise reduction plugin (not DPC legal?). NeatImage is definitely DPC legal and I don't see why ISOX wouldn't be also. As long as it's applied to the whole image and there is no selective editing going on I believe it would be legal. This picture is really neat. Makes me wonder what it is sometimes. Well anyway it's cool. Very cool picture. Congrats on the silver! Who gave this a 1? Show yourselves. Great shot! One tiny adjustment that may make it better in my opinion, would be to NeatImage it. Its a bit grainy in some areas. Great shot overall though! beautiful! 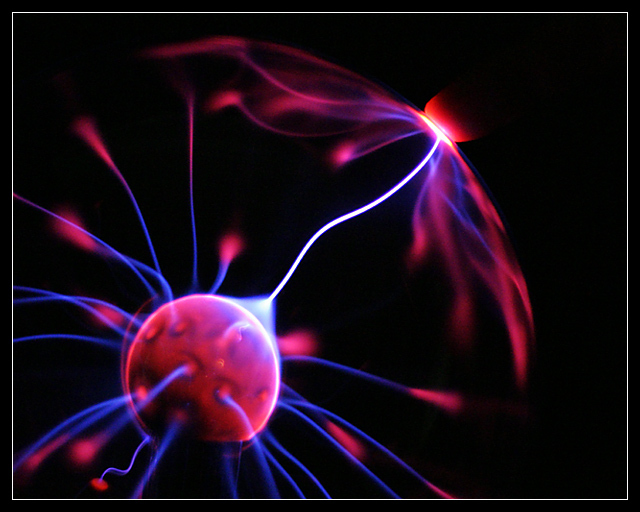 i love plasma lamps...so mesmerizing. great work! No, no, no - there's no experiment here - just touching the lamp. Personally, I think the colours are average for this kind of shot - nothing special, focus is adequate - and the idea's alright but not exactly ground breaking - and the border's a bit unnecessary and, and, and - I reckon it should be disqualified really when all is said and done. Yeah Jon sure! Hey Bod, waitin for a comment here! I think you should have one the blue ribbon! Congratulations! :-) A good friend of mine kept her fingers crossed for this submission, and - not at last - I also like this picture very much! :-) I think I have a loooooooooot practise to do on my brother's sphere. Would you tell me, too, how you have done it? Brilliant work! Great job, congrats on the ribbon! This isn't a lava lamp, it's a plasma lamp. Way to go Bod! Good to see ya back again. You deserve it! This is an awesome image! Go Bod! Go! Yay! Nice work! Really cool picture. Ya gonna tell how ya did it?? Congrats! Well deserved. great idea and execution - the finger tip even looks cool....and I like how the entire hand is not in the shot. nice work. This would have been much better if you would have cast a little illumination on the actual finger like an E.T. effect or something. I love this one. I was thinking "why didn't I do that?" because I have one of these plasma balls. I tried the shot, for myself and realized it's not an easy one to get. Kudos to you... well done! Very nice. I like these kinds of photos alot. Just beautiful and right on the theme. Good color and clarity for this type image. Well done. One of my favorites in this challenge. I have no idea what I'm looking at, but the composition and coloring are remarkable. 10. I don't know what this is, but it's a very cool shot. Well done! How funny! I submitted a very similar picture. I have to say I much prefer yours. Colors are clear and crisp vs. my fuzzy time lapse. Nice work! Predictable image for this competition, but a nice capture just the same. Well done. This is definately on of the sharpest images with this subject. I also find it to be one of the more visual appealing. Nice conposition. cool photo! I love the colors and the capture of the lights...has a very 'scientific feel' to it...I have to give this one a 10. I wish I had one of these so I could play and take cool pictures!! Very neat shot. Love the finger, the lights and the colors. Good work....Kool shot. Wow, this was also my idea but I never had the time to do it, but this one is absolutely perfect, this is a winner I think. I love this shot. I wanted to do something similar but didn't have access to one of the globe thingy. Gonna give it a 10! Incredible photo, how was it done? Smart, smooth shot. Perhaps a little too much inactive space top right, and lacking a scientific experiment, but very attractive nonetheless (these plasma balls are always mesmerising). great effects. I don't like the finger, but i realize it was necessary. As a side, I wonder if a longer shutterspeed would have producted some really cool blurrs? If you are the guy that ribboned on this lamp before, i think its quite pathetic to pull that stunt but still a pretty cool pic. if you are someone that saw the ribboned pic in question and wanna copy that, I think that is pretty lame, but as I said the shot is cool. and last but least if You are a newbie that has never seen the picture I speak of above, Great pic keep up the good work. Well composed ,nice colors and focus,10 from me! Proudly hosted by Sargasso Networks. Current Server Time: 04/19/2019 12:16:25 PM EDT.